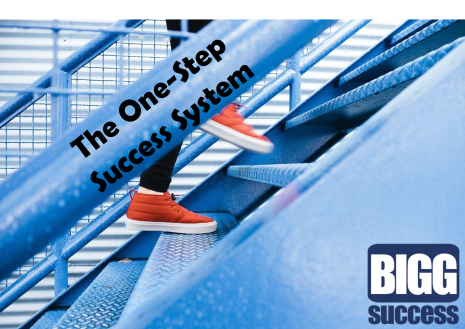 George & Mary-Lynn discuss the one step success system that helps you succeed BIGG! 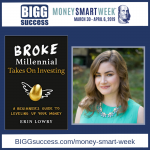 Click play to listen to The BIGG Success Show. A one-step success system sounds too good to be true. But stick with us – you’ll soon see that it’s the only way to succeed. It’s the secret of every person who does succeed. As we prepared for this post, we wondered: Why are the floors in a building called “stories”? We found the answer thanks to Word Detective. We can think of stories in a building as levels. BIGG success is reached one level at a time. You won’t find an express elevator that takes you to the top. There’s not even an escalator. You have to personally climb the stairway to BIGG success. A lot of people struggle because they keep looking at all the stairs they have to climb. They get exhausted before they even start. So they never do. They just stay stuck in the status quo. How can you make sure you don’t get stuck? The secret is to stop thinking about all the stairs. That’s what all high achievers do. Like them, you need to focus exclusively on getting to the next level. You get there by taking one step, the next step. Now we won’t kid you – as easy as that may sound, it’s not always the case. Matter of fact, it may be downright hard at times. You’ll get tired. You’ll feel like you’ve used your last ounce of energy. You’ll get discouraged. But you’re never defeated until you give up. So somehow, some way, find a way to keep climbing – step by step, floor after floor, until you reach your dream. It’s BIGG success in a step – the one-step success system of all BIGG winners. And here’s some consolation for the journey: You’re creating a story, your story. Just like the buildings of our ancestors – you’re developing a series of stories, one layered on top of the next. Now think about this question: Don’t you love stories where the hero overcomes an obstacle? You’re the hero in your stories. People are rooting for you to succeed. And the funny thing is – the more you succeed, the more they will root you on. BIGG success is life on your own terms. You will face strife on the journey to success. The strife will make you stronger. It will prepare you for the BIGG things ahead for you. So keep climbing. Keep building. Take the next step to live happily ever after. That’s BIGG success!